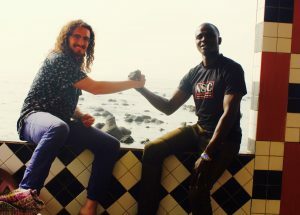 One of the most amazing things to come about in Senegal is the friendship and collaboration between Zea Stallings of The Copper Children and Senegalese singer Youmay. These two sang to and with children, collaborated on singing together and now have become great friends. Zea decided to help Yousoupha and his brother a drummer with their dream of creating a recording studio in Dakar as well as purchasing a drum kit for their studio while visiting in October. We have plans to create an exchange with musicians/artists from the US and Senegal.